Bright, sparkling eyes with a clear vision say so much for our youthful looks, besides being a big asset in leading an active life. Vision health benefits from good nutrition and regular exercise regime. Topping the list of nutrients for healthy vision is vitamin A. A sure way of getting adequate amounts of this vitamin is consuming fruits and veggies like carrots, papaya, mango, peach, spinach, kale, broccoli capsicum etc. Of course you don’t have to worry about how to cook using each of these ingredients…. Just flip through the recipes for healthy eyes in this section to learn and widen your culinary skills. Broccoli Soup, Nutritious Jowar and Tomato Chila, Carrot Cucumber and Rajma Salad in Mint Dressing, Carrot Spinach and Black Grape Juice are a few recipes you will find in this section to ensure an adequate intake of vitamin A. Get your share of antioxidant vitamin A from these recipes and enjoy bright vision for life! 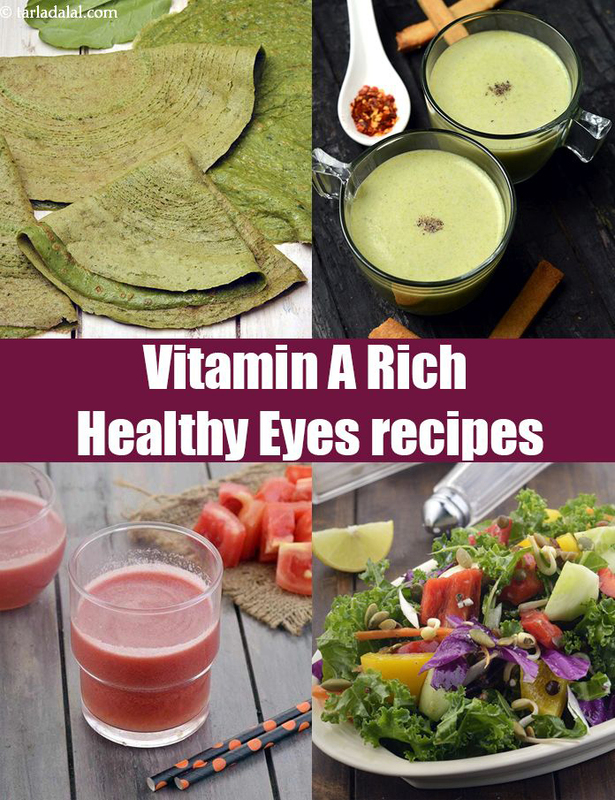 If you liked our Healthy Eyes Recipe Collection, you will find these articles of interest. Fig and Apricot Shake is best had early in the morning for breakfast as your body conserves more nutrients at this time of the day. Packed with iron, fibre, calcium, vitamin A, natural sugar and protein, these dry fruits will provide you with energy and will also satiate your hunger.